PARSHIA: Oh, my apologies, cultural differences. How would you like me to address you? CICERO: (puffs up his chest) I? Myself? How would I like myself to be addressed? I, the saviour of the Republic, defender of the mos maiorum, father of the fatherland? PARSHIA: (raises eyebrow) You’re asking me to call you father of the fatherland? CICERO: Oh, no no! (chuckles in false modesty) No need to call me that. I will eschew all of those titles and honours. Just for you, of course. Call me Cicero. PARSHIA: Right then, Cicero, take a seat, take a seat. I would like to talk to you about your paper. CICERO: With pleasure. I hope you found it to your liking. PARSHIA: I think your topic was about Roman attitudes to divination and augury? PARSHIA: Oh the style? That was quite good, actually. But I have a few very pressing issues before that. PARSHIA: Indeed. Now I ask this with all due respect, but… is this the first time you’ve written an academic paper? CICERO: (stands up) By the immortal gods! What sort of infernal delusion has vomited itself out of the underworld and taken charge of your senses? You should very well know I’ve written about half a library of Latin philosophy! PARSHIA: Yes, yes, but I meant a research assignment. One which fulfils modern research standards. CICERO: (sits back down) I beg your pardon. I suppose I am a little old-fashioned. That is to say, I hold fast to the paradigms of literature which have stood the test of time for centuries, never diminishing in their power or insight. But do tell me: I’d like to know how in Hercules’ name my work has failed these newfangled “modern research standards” you speak of. PARSHIA: Right then, I’ll start with what surprised me the most. Why did you write this as a dialogue between yourself and your younger brother, Quintus? CICERO: That shouldn’t be any sort of surprise. PARSHIA: Well, admittedly, it’s in keeping with your other work, Cicero. CICERO: But you seem to be utterly baffled at my decision to write the thesis in dialogue format. PARSHIA: Of course I’m baffled. I have never, in eighteen years, marked an essay which was written as a dialogue. Why did you think it would be a good idea to write this as a fictional conversation between you and your brother? CICERO: Well, good sir. If you knew anything, you’d agree with me that the best philosophy was written in dialogue. Haven’t you read anything by Plato? CICERO: Ah, so you see! I gave you philosophy of the highest calibre. PARSHIA: And that gets me to the next rather critical issue. You… stole some of his arguments. CICERO: Well yes, I just told you. I handed in the best philosophy I could find. PARSHIA: Yes, I know Plato was relevant to your topic. The problem is that you took his work and didn’t reference it properly. In fact you didn’t reference anything at all. PARSHIA: This passage here? You just said that Plato wrote this. You didn’t cite the work, chapter and verse. CICERO: Why? Would it be too hard for you to find exactly where Plato says this, if that’s so important to you? PARSHIA: It’s not just important to me. It’s important to everyone who reads your work. As a community of scholars we need to be able to check the references in each other’s papers, so we can follow arguments back to their original sources. But you haven’t done that for me. CICERO: Wow. So you really don’t trust me unless I put footnotes over every bit of secondhand text? PARSHIA: It is a requirement. CICERO: It’s almost like you don’t respect me as a Roman. I did read a lot, but I’ve never seen anyone cite the way you ask. What exactly do you mean by “chapter” and “verse”? PARSHIA: Haven’t you seen the little numbers on the side of the Loeb texts? PARSHIA: Well, not just the Loeb editions, any published texts should have numbers indicating the divisions of sections. CICERO: Well, not the scrolls in my library. PARSHIA: Where did you get your texts from? CICERO: Oh, some of them were gifts, some were inherited, some I bought from the local bookshop on the Palatine, next to the fullery. They have sales on after Saturnalia. PARSHIA: So you’ve been using texts that don’t have any versification? CICERO: Well, you show me a better text than the ones I have at home. PARSHIA: All right then, here’s the Loeb edition of Plato’s Republic. CICERO: Sweet Hercules. (tosses it in his hands) What a strange device. (flipping it open and turning the pages back and forth) Is this what they call a… a codex? PARSHIA: It’s lower case Greek letters with polytonic accents. CICERO: “Lower case”? “Polytonic accents”? I’ve never seen that before. It’s like gibberish to my eyes. Oh but look! There are spaces between the words, and dots at the end of sentences, so even a child of yours could follow along. PARSHIA: You don’t need to be patronising. CICERO: So what are these funny symbols down the side? PARSHIA: Yes, those. They’re Hindu-Arabic numerals, indicating chapters and verses. CICERO: Barbarous codes. Foreign letters. I don’t think I can master this system quite yet. (snaps book shut, and gets an idea) Ah! But my slave could work on this, and he’ll put in those “chapter and verse” numbers, and it’ll all be well. PARSHIA: Oh, well, this is a little awkward. That would usually count as collaboration, and we don’t allow that for graded assessment. But maybe if we argue you’re from a culturally disadvantaged background, the board might let you get outside help for the citation and bibliography. CICERO: Now I think you’re being patronising, calling me culturally disadvantaged. 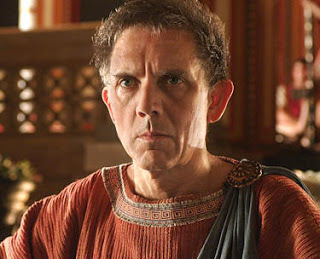 I’ll have you know I had the best education a Roman citizen could ever have. PARSHIA: But you can’t read a Loeb. CICERO: My slave Tiro will work it out. He’s brilliantly clever, and I never need to credit him for anything. PARSHIA: (shifts uncomfortably) Ahem. Moving on, I have some more peculiar observations. PARSHIA: You know this is meant to be an academic paper, for a scholarly audience. CICERO: I believe I delivered the most majestic writing I could muster, worthy of noble Romans. PARSHIA: You made a lot of pop cultural references. PARSHIA: Well, I’m not sure if the comedian Plautus is the best kind of resource for a philosophical treatise. CICERO: Everyone likes Plautus. I could have done Terence, but he’s a bit more classroomy, if you know what I mean. CICERO: I heartily disagree. Comedy is a great rhetorical device. Keeps my audience awake. PARSHIA: So was that the reason you also put in that quip about the eating habits of the Pythagoreans? CICERO: (sniggers) You saw that, didn’t you? 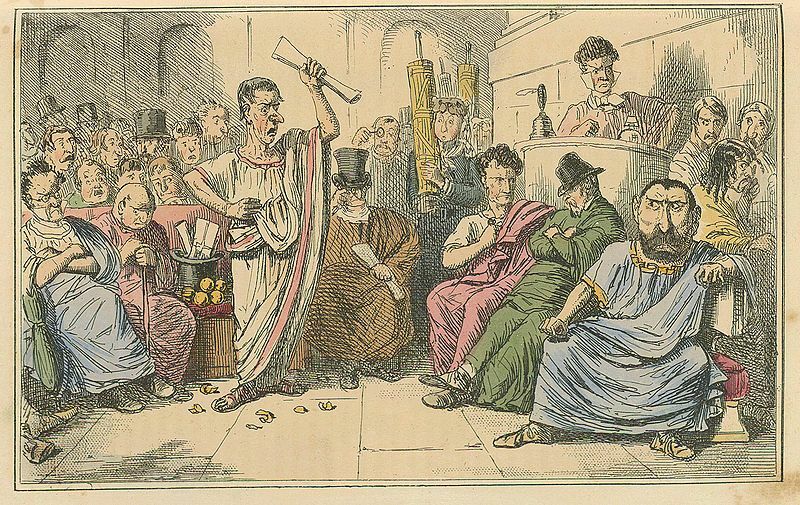 CICERO: And even then, it didn’t stop them from being a bunch of windbags! PARSHIA: Yes, you made that joke too. CICERO: Ah, I can’t help but laugh at my own brilliance. PARSHIA: You didn’t think it would be at odds with the tone of an academic paper? CICERO: Quite the contrary. There’s nothing worse than boring philosophy! If I ever write anything that’s dull or laborious, it’s fit only for the rubbish pile. PARSHIA: Yes, I’ve already said that your style is very good. But you needed to make it absolutely clear how your arguments advance and support a contention. I think that sometimes gets a little lost in your dialogue. PARSHIA: Like where you took an extended quotation from your own epic poem that you wrote about yourself. CICERO: Ah, On My Consulship. I don’t see any problem with that. It was completely in character for my brother to recite my own epic poem to me. PARSHIA: Your younger brother, Quintus Cicero, the one whose career would be eternally overshadowed by your fame – he would have recited these lines to you? CICERO: Stirring words, if I may say so myself. Oh, I just did. CICERO: What, you… think it wasn’t in the best taste? PARSHIA: Well you tell me. CICERO: I’m getting tears in my eyes just listening to it. PARSHIA: I’m sorry, but it just doesn’t sound professional enough for an academic paper. We usually advise against even using the first person pronoun. CICERO: I can refer to myself in the third person. CICERO: (drops voice) And what are you, barbarous academic, going to do about it? PARSHIA: I can’t let your paper pass unless you make major changes to it. CICERO: You’re jealous because no one is ever going to read your work to find out about you. They only read your papers to hear more about people like me, the great Roman and Greek authors and statesmen. And in thirty years time your theories will be obsolete, but for thousands of years everyone is going to remember that year I, Cicero, was consul, and recite my poem again and again, and again and again and again! CICERO: Yes. I have no more need to associate with this newfangled modern research. I’m a classical author, and by the immortal gods I’m proud of it. Good day to you sir. PARSHIA: Don’t forget to take your scroll case on the way out. PARSHIA: And one last thing. PARSHIA: (smiles) Your epic poem survives only in fragments. Translations of De Divinatione from the Loeb Classical Library, vol. 20, English translation by W. A. Falconer. Cambridge, MA: Harvard University Press, 1923.